I get most of my best ideas at two in the morning. I find myself wide awake with such excitement while trying to figure out how I would logically turn this idea into a reality. Then the torture of waiting all day the next day until we are free to head out to Home Depot or where ever the destination is. The guys from Home Depot know us pretty well. Here comes the little crazy lady with two kids in the cart asking them about some outrageous projects. Yup, that is me. 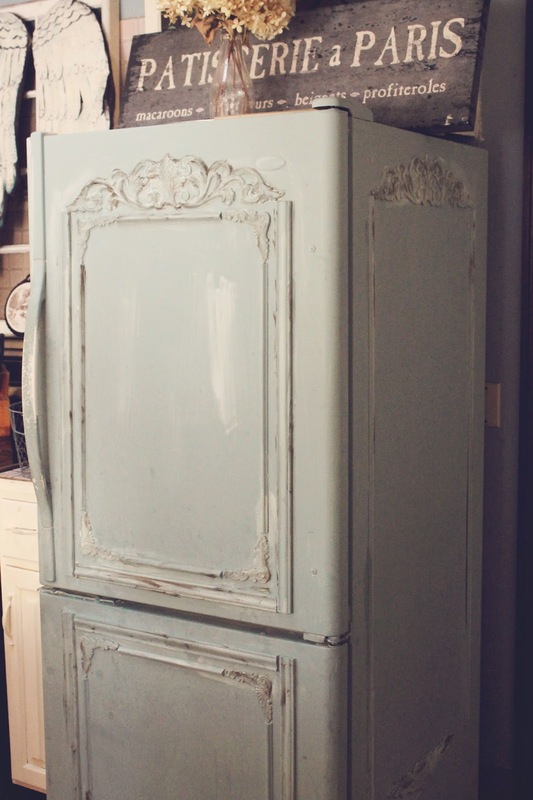 This time around, it was to turn my old ugly fridge into a shabby French beauty. I know it sounds crazy but I have to tell you, I think this is one of the best projects I ever came up with. This is what it used to look like...dirty and outdated. This is another example of getting too excited and forgetting to take a before picture. I did this project about a year ago. In retrospect, I wish I had really planned it out and ordered better looking appliques instead of rushing and just getting stuff at Home Depot. Lesson learned. I am going to apologize for the next sets of picture because we haven't had a sunny day in awhile. Here it is. When I was writing this post I thought maybe I should freshen up the paint. Then I realized I don't have any more Annie Sloan's Duck Egg and it would take a few days to get here. This is the perfect example of my complete lack of patience. This beauty looks pretty good for a whole year of rough handling without any wax on it. I didn't have any dark wax when I did this project. So I mixed clear wax with dark brown paint to antique it a bit. At one in the morning, I think it was the best I could come up with. : ) I do wish I have another old fridge to do this project properly again and show you step by step. But in the mean time, I am quite content with it. This is what it looks like on a normal day. the perfect frame for Bella's arts. Reminder of how beautiful life is. Or how amazing love is. Beautiful. I love it. Just an amazing idea. Hi Linda, check out http://www.anniesloan.com/ You can find a stockist near you or they can even mail it to you. The color is Duck Egg and they sell them in a quart size. I just did one coat of it. Good Luck! Only ONE coat?! Wow! What if the fridge is the original black? Do you need a special paint for a base coat? Only ONE coat?! Wow! What if the fridge is the original black? Do you need a special paint for a base coat? Did you do a white wash on it? That is beautiful. What a clever idea! This is beautiful! What a brilliant fix to pretty up a boring refrigerator. Would love for you to share at Fridays Unfolded! You're so blessed with an open minded man. Lol My husband just thinks great another project she is on. Lol Good thing he loves me,but after 24 years I guess he's used to the things I do. This makes me wish my fridge was awful so I could paint it! I LOVE this! Amazing transformation, guts and creativity are wonderful attributes and you have both. Lovely blog I am a new follower. What a wonderful gutsy move! It really works in your space. Love it! Best Fridge ever! Wow, amazing idea. Did you use a primer? No primer needed at all which is amazing. I only did one coat of chalk paint too. It actually painted better than any piece of furniture. The pictures are taken after a year so it stayed on pretty good. Victoria, you are welcome to come over and do MY ugly fridge anytime! LOVE this project and am pinning it now! Ingenious!!! 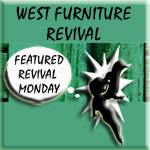 Please share it at Revisionary Life...www.revisionarylife.blogspot.com - Thrifty Life Thursday. It's just wonderful! LOVE this idea! What kind of glue did you use to attach moldings? Jennifer, that was the reason for a lot of my screaming in the middle of the night. I started out using liquid nail which worked fine with the decorative moldings. But the bigger pieces kept coming off so I had to use super glue and that did the trick. Victoria, where can I find detailed instructions and materials for this project? Apparently I missed something somewhere and would so LOVE to do this! It is absolutely AMAZING!! I can just hear my hubby now, "Honey, what are you doing to the fridge?" Do you think men wonder what the heck happens in our brains sometimes. You just know they go, "wow" when its done and go tell all their friends, right? this really is an amazing idea! I'll be featuring this post tomorrow at Be Inspired! What an amazing redo. You are simply brilliant! Thank you so much for sharing and I will be pinning for sure. I am in absolute awe of this - it's incredible !!! WOW - have to pin this all over the place - pat yourself on the back for this one - you did a spectacular job and now I want an old fridge lol - seriously I really do - maybe for the mudroom off the kitchen!!! Wow, This is totally amazing! You did a fantastic job!!! This really is one of the most amazing paint projects I've seen. I think it's perfect just the way it is. Love the color!! Saw you featured at Be Inspired....I'm inspired. Isabella is so adorable and a sweet husband too! You are the most amazing person EVER! What a terrific idea, and it turned out stunning. I am in love! Going to Pin this and hopefully transform my own fridge. Do you mind sharing how you prepped your fridge before painting? Thanks so much for this inspiration! Dark wax? I'm not sure what you mean? Oh my goodness, that is FABULOUS! I think you were very creative to think outside the box with this project! This was ingenius! so creative!!!! LOVE~ LOVE~ LOVE!!! I don't think my hub would want me to do this... but even just the frame idea on the fridge, would be fantastic and I could probably get by with that! ; ) LOVE IT! Made me think of all the 'metalish' items I have about... file cabinets!!! AWESOME!!! This turned out beautiful...it looks like something straight from a high end Paris boutique! Great job! I may try this on my old and yucky washer and dryer b/c my fridge is new. Thanks for inspiring :) I'm a fairly new blogger (6 mo) so welcome to the community! It's so much fun and there are wonderful people to meet. I signed up as a new follower. You are welcome to check out my blog, www.diybeautify.com. maravillosa idea !! amo ese refrigerador ! You are amazing! I love this and I'm pinning it right now. Visiting from French Country Cottage and following on GFC. Have a great weekend! I have never seen anything like it!!!! And you used ASCP without wax? See i just began using ASCP and love it but hated the wax because I am highly sensative to odors and the wax odor even bothered my hubby whom is never bothered by anything. Glad to hear it has held up so well. Wonderful. This is amazing, I want to do it! OMG! You have just solved all my kitchen problems in one go! We're in the middle of trying to make a rustic looking old kitchen, but of course all the appliance look too modern to fit in. I absolutely LOVE what you've done in this project and like you, can't wait to go shopping for the bits I need. Thank you so much for the inspiration. This is so cool! Love the appliques! This is so awesome! How many ugly refrigerators could have been saved...haha. Thanks for sharing this fantastic inspiration! Love it!! And I had to laugh when you said you do not do anything that needs prep!! That is so me! My husband always scolds me that it is the most important party....but I just go to it, what ever I'm thinking! Has worked thus far! And NOW I have to do my old white fridge!! Thank you! wonderful. found you via FB. look forward t reading more of your blog, and FB page if you have it. This is just plain brilliant, Victoria. It looks like some vintage cabinet with the great distressed finish. I just found your blog. I must say this is an awesome redo. I am definitely going to give this a try! I love the blog and am your newest follower. This is amazing. I would have done this for sure but we got a new fridge last year. 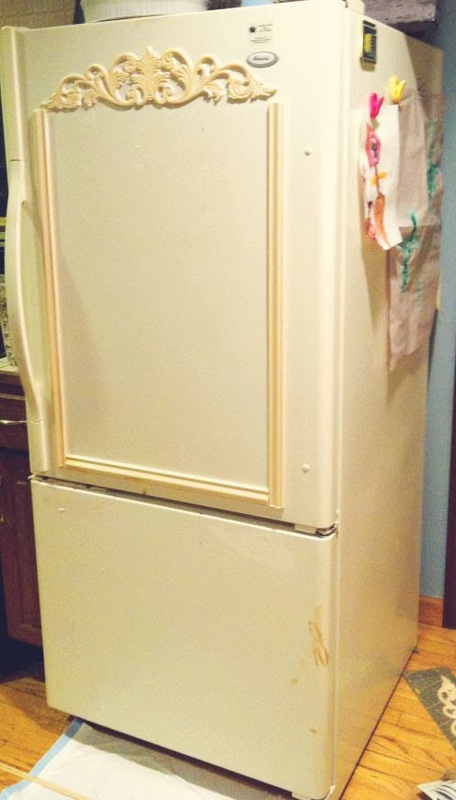 This is a must for anyone with an old fridge. Well done. New follower. Love, love, love it! And I understand being so anxious to get started that you forget to prep or take pictures. One question, though: Did you paint the seals around the doors? Thanks for the inspiration. I didn't paint the seals. It is funny...I actually had to walk to the fridge to check because I forgot about it. Rhoni, I use liquid nail but for the bigger trims, I also had to use super glue. Good Luck and have fun! LOVE IT!!! Im just now going to do this as soon as I slow down and askm would this work on the stainless steal type fridges? I use Annie Sloan all the time, but have never done it on stainless steal....what do you think? Danielle, stainless steel...hmm, I feel like it should work just fine. I have painted ASCP on pretty much everything. It might takes two or more coats?? let me know how it goes! Oh my!! I am sharing this everywhere! What a fabulous transformation Victoria! Where can I get this paint. .I know you can make your own chalk paint do you think it will work as well. .I so want to do this to my fridge. .Thank you for sharing. .
Hello! You can check out Annie Sloan page..www.anniesloan.com for lists of all the retailers that carry her paint. Good Luck! Hi, Found you through a Facebook post by Amy at the Maison Decor blog. This is incredible! I think i have to leave work right now and go do my fridge! What a brilliant idea! Thank you, Cindy! If you do try it with your fridge, let me know how it works out. what an amazing idea--it's beautiful--tfs! I've never seen a refrigerator look so good, Victoria! Makes me wish I had an old one to do this to rather than the new stainless steel we got. This is such a wonderful idea--I found this thru Amy posting it on Facebook. Going to go look for how to follow you now. Great job! I think this will be happening to my fridge , dishwasher and may microwave... I can't stop thinking about it.. BUT i am just finishing up a bath tub surround mosaic all mural...soo NEXT project ! What a brilliant makeover! This is truly inspiring! I would love to share a link to your post on my Facebook page! I hope that's okay! Victoria where did you find the old vintage pieces? I can't stand it! This is THE most awesome makeover EVER. You rock! I hope someday I can be brave enough to try this. Thank you for the photo's & narrative. fabulous idea - sharing on my facebook page. 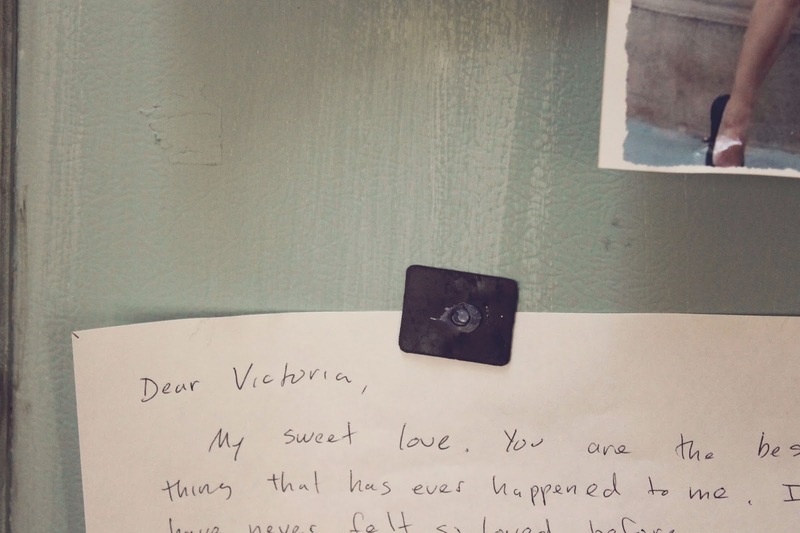 Victoria, what did you use to adhere the molding to the fridge? You are a creative GENIUS! Melanee, I used liquid nail and super glue for the heavier pieces. It is super easy to do. GO for it! Love this idea, just an amazing look..... thank you for sharing and inspiring us all!! Wondering, though, where you buy the moldings (or appliques?) to do this??? Thank you again. Brilliant idea, Victoria. You are one amazing individual! Love, love, love your fridge! Had to try it on my own plain side by side fridge. I used homemade chalk paint made from leftover paint from my kitchen cabinets so that all would match. Turned out great! Thanks for being my inspiration! Love your blog!! This is so amazing. I love what you have done. I have painted my fridge with blackboard paint and I do love it, but it is a side by side and it is not going to look as beautiful as your over and under fridge/freezer. I am so happy for you and you did yourself proud!!! Just enjoy it (I especially love that you did not add wax to it. 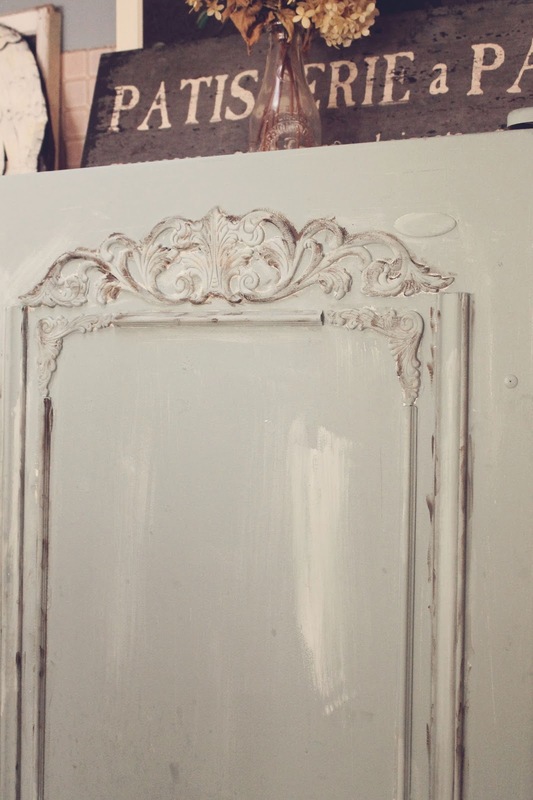 I love the natural way that chalkpaint ages!! Here from Better After ~ ~ what a cute idea. Love it! Hi Tasha, so these pictures are taken a year after I initially painted the fridge. I wipe it down with a wet paper towel if I spilled something. So far the paint looks just like it did when I first painted it. Though the side of the fridge that is right next to my stove has some oil stains on it from me cooking everyday. I guess I could just put another coat of paint on it but I figure it is going to get dirty anyway. I didn't wax it at all either and I just did one coat. Hope this helps! ps. love your work. 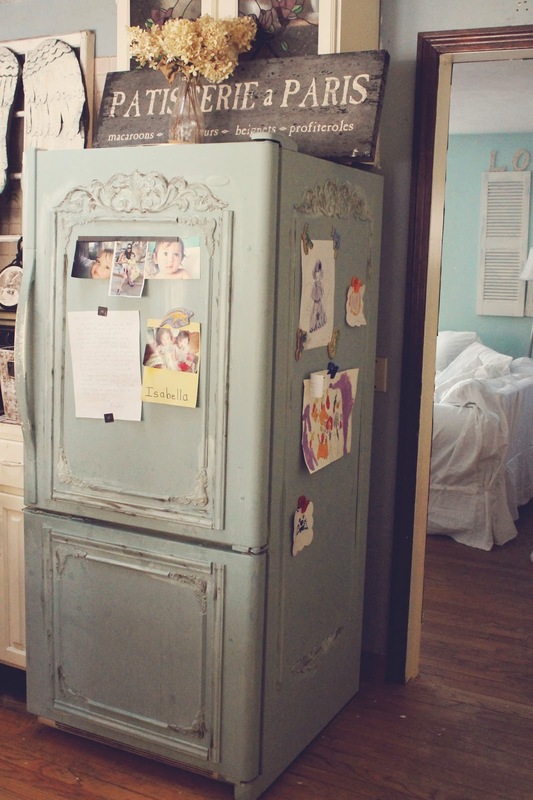 I have always loved your fridge and makes me wish I had an older one to do this too. Can I ask the details on the paint mixture? I love the shade of blue so much. What color of white did you mix it with? Was it chalk paint as well? Hi Brandy, I just did a coat of chalk paint® in Duck Egg. How much paint did you need to do the one coat? Beautiful!!! Jen, honestly, I think I used like less than a quarter of the can...way less. Victoria, thank you so much for posting this, I did it and LOVE my "new" fridge - loved it so much I took the look over to the cabinets! Thanks again! I think I will do this to my freezer. Did you add the wood pieces? If so, how? I'm obsessed!! Hello! I just used liquid nail to add the pieces. Good Luck! You did a great job, very inspiring to the rest of us and I've painted a lot of things in my day but never a refrigerator, what a good idea, my frig is 31 years old and STILL WORKING, I can't believe it neither can anyone else, its a Whirlpool from Gemco I bought in 1984. You have a lot of great ideas, and aren't AFRAID to paint anything, You Go Girl!!! bonjour, superbe idée ! Cette nouvelle version du réfrigérateur est magnifique, vraiment excellent ! Je me suis permise de mettre votre lien avec votre image dans un article sur mon site et sur ma page facebook. si vous préférez que je l'enlève, je le ferai. Thank you! Of course you are more than welcome to share! What a fabulous idea! it looks perfect just the way it is! I would love to do this with my old kitchen fridge but it wouldn't work because I have water and ice access on the front door and my fridge has 2 narrow doors. 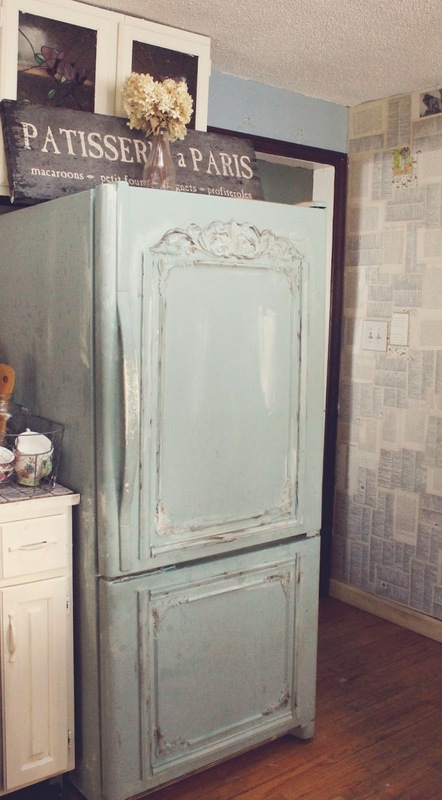 this is the most fabulous fridge makeover I've ever seen! Thank you, Sandy. It could work with your fridge if you don't use the wooden moldings but use smaller appliques to frame it? This fridge makes me wish we actually owned our condo. I am planning to redecorate my kitchen a little vintage french country. I just love it! FABULOUS!!! I wish I had seen your blog before now. 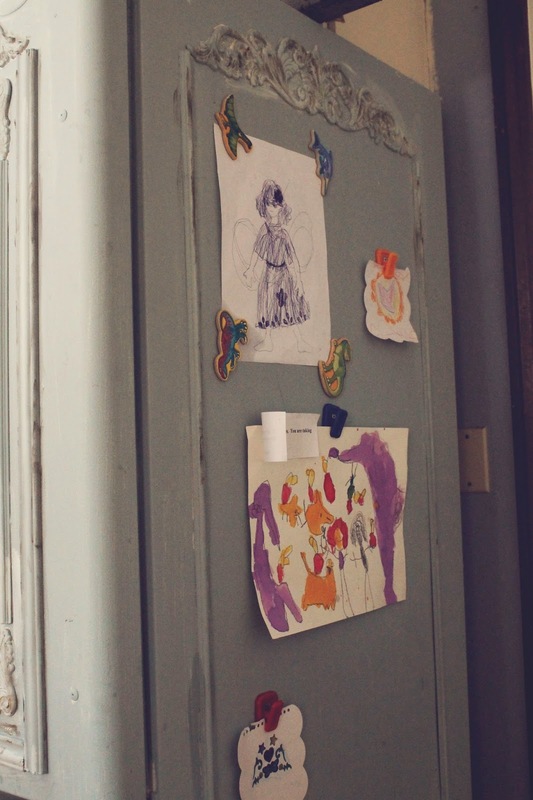 I painted my old fridge with black chalk board paint & I had lots of wows about it. Your fridge beats out chalk board paint any day. I LOVE Shabby Chic & Vintage. You nailed it with this project. My black fridge might need a sudden facelift! I have the paint, the fridge...but no wood pieces : ( where did you get yours from? Hello! I got the moldings from Home Depot but I always say to people, if I can have a redo, I would use more elaborate appliques. Check out Efex appliques and I believe they ship anywhere. You just made my day! I am so doing this to our weekend house fridge! I might just add some Lincrusta wallpaper to the doors too! Thank you for sharing! This is awesome! Pinned it, posted it in Facebook....and want!! SO SO cute! I love love love this!! Now to find an old refrigerator!! Plans for the oven/dish washer??? just go with the proportions of the appliances, yes, not necessarily the same exact design as the refrig, right??? but the same color……. I love this, and you did a beautiful job. I see that the post is almost 2 years old and I am wondering how this held up over time? Hi! I am thinking about giving this a try, but I have 2 questions. Did you brush or roll the paint on? and you said you did do a wax that you added paint to, did you rub that all over the fridge or just onto your appliques? Thanks, nervous, but excited to give it a go! This frig is amazing and I have a friend who is just like you. I sent her the link to this post and by noon tomorrow her frig may look similar to yours. Great job. Love the AS paint - just the BEST. Would you kindly describe the steps? I am looking forward to starting this ASAP! Thanks so much for the idea. Hi Daniela, I am so sorry for my late response. So I just cleaned the surface of the fridge then glued the moldings using a mix of liquid nail and super glue . Let those dry then paint Annie Sloan chalk paint right over it. I just did one coat with no wax over it. The paint is still looking good after almost three years later. Good Luck! Does the fridge feel funny after you get done? like a chalk board or does it feel smooth and glossy? The fridge doesn't feel any different? I guess it feel a bit more chalky then glossy. 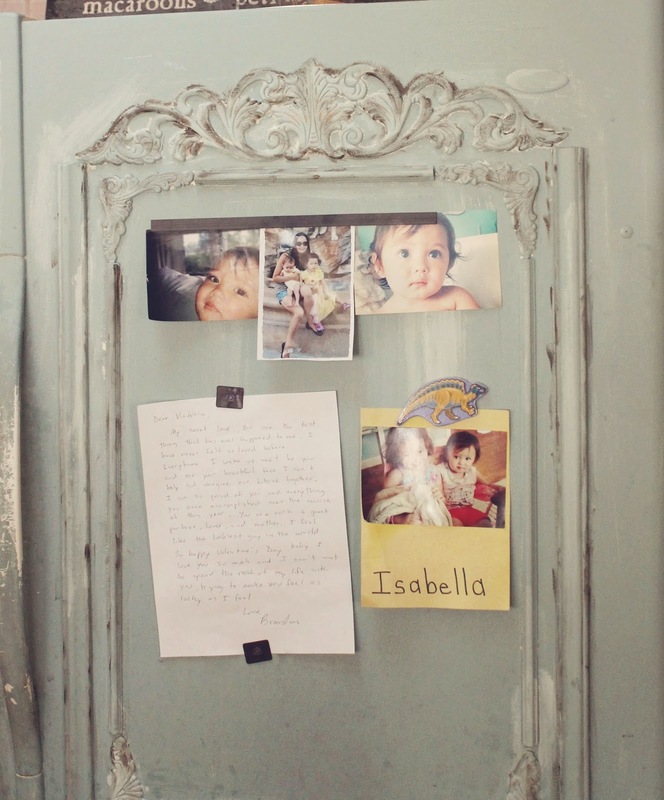 That is one antique and quite beautiful refrigerator that the author has. I wonder if there was any repair done on that fridge. Well, it seems like it's still functioning considering that fact that the author still uses it. It turned out wonderful! I wish I had the guts to do this. But no, I need to keep all my appliances "desirable" until I can sell this place and move into my retirement home. THEN I will do whatever I want! And painting the fridge might be a project. That is, after I create a mosaic of all my saved up, broken chintzware cups, teapots, and plates around my fireplace. My fridge is the textured white plasticky stuff. What can I do with that? Would I have to fill it in or something first? Thx! It's such a great idea! I really hope my fridge will work! Amazing idea!That is beautiful.I will have a try. Lovely doesn't begin to describe this fridge. I'm headed to the beach house this weekend~ don't be surprised if my rusty ol fridge gets some new life breathed into it! Fantastic ! Hope I can find the wooden pieces at Home Depot!!! Thank you for the beautiful idea! I'm defintely doing this on my...(wait for it!)... brand new fridge! In fact, I just ordered it and don't even have it yet. Haha. But I'm already buying my supplies. Can't wait. I know...I'm a little crazy. Hello Kristen, I wanted to thank you for a solution to my ugly fridge! As much as I would like to buy a retro "Big Chill" fridge they are out of my price range. I noticed that you recommended efexusa.com for finding appliques. I wanted to also suggest www.decoratorssupply.com for appliques, mouldings, corbels or any other embellishment one may desire. I have been a picture framer for 20 years and use their appliques to add embellishments to plain moulding. Usually I am gilding them but they can be painted as well and they can be heated to conform to a curved surface. Thank You so much for sharing your process and the materials you used. I think it is stunning just the way it is! Fridge is used in many ways.people use fridge all the times I found the bestLED TV Service Center in Hyderabad who offer doorstep services. Ok this is amazing, I have a question though. I am moving into a house and the applIanes are outdated and hideous. I just came out of a two year divorce and I am financially deptleted so I am cruising Pinterest for DIY updates and I am definitely going to do this to the fridge. Do you think I could do the same thing to the other appliances (stove and dishwasher)? It’s great information about the Google AdWords and its various facts. I learned from this a lot. Thanks for sharing this information. Are you yearning for Whirlpool Fridge Service Center in Hyderabad ? When looking for a refrigerator that's long-lasting, you'll wish to appear in the options of Whirlpool refrigerators. As a result of this whole has been serving many folks for several years currently, this has been extremely regarded and trustworthy because the white goods to shop for. Thank you for providing nice information. Here is info of another one for Samsung Refrigerator Service Center in Hyderabad these guys are doing their job well as yours. From my personal experience I'm suggesting them. Nice information thanks for a sharing a post. I understand you perfectly, recently I also had to look for a company to fix my home appliances, but I was advised sfappliancesrepair.com so I was pleased ! BLUE STAR AC Repair Hyderabad Service Center Secunderabad is repair and repairs by in india. We give offer at low cost of price rs/- 650/- with 3 months of warranty. We offer coverage throughout india for home & kitchen appliance service and repairs by fully trained & certified experts.We offer repair services to alla your home & kitchen appliance items that ranges that includes Repair, Installation and services. We Whirlpool Refrigerator Repair Hyderabad Service Center Secunderabad are unit repairing all sort of refrigerator like single door and multi door refrigerators repair at your doorstep. We best service center for refrigerator at a low cost of price rs.350/- with 3 months of warranty on our every replaced part in your faulty appliance. We Whirlpool Washing Machine Repair Hyderabad Service Center Secunderabad providing an excellent solutions to our valuable clients to our Onida washing machine at a low cost of prize 350/- with 3 month warranty.we are specialized in providing home appliance repairing service to our customers. This home appliance repairing service is performed under the strict guidance. can read the best of article on our website. For more, visit our website. Whirlpool Service Center in Hyderabad offers doorstep services. EServiceHub.in provides Whirlpool Home appliance Services with 100% Customer Satisfaction. Our quality services in hyderabad, refrigerator repair centre in hyderabad and our expertise in repairing the appliances has gained a wide reputation to such an extent that all the global brands feel delighted to have us as their authorized service partners for hyderabad city. Our giving the offer price rs.350/- with 3 months warranty. Your refrigerator is the hardest working appliances in your house. It runs day and night to keep your food fresh and safe. If your facing the refrigerator leakages or not keeping your food cold enough. IS Techno services provides the service and repair center we work all brands repair and we will come to you home to do the repair and services. haier washing machine repair center in hyderabad We will cost of price and high quality products. haier washing machine repair center in hyderabad We have practical experience in service and repair. At our technicians are well knowledged and communicative. We give the offer at low cost rs.350/- with 3 months warranty. Our service center provides all brands of services at warranty prices with 100% customer satisfaction. ONIDA Microwave oven is best known for its quality, people who wants very quick heat for food items ONIDA Microwave ovens is the best. ONIDA microwave oven repair center in hyderabad The service centers are also to be considered to get it repaired quickly.ONIDA microwave oven repair center in hyderabad Digital electronic service is the best option which has very good technicians and have experience in resolving problems. At low cost of price rs. 350/- with 3 months warranty. Our service center stands as a best home appliances service center in hyderabad. Whirlpool Fridge Service Center in Hyderabadis the best repair service offering quality service with affordable charge. This is an amazing project! Creativity strikes us at the silliest times but its so worth it! we are providing fridge services in jaipur city. Refrigerator Repair Service in Faridabad - If you are living in Faridabad and looking for refrigerators repair in Faridabad then you can choose repair services point for this service. Repairservicespoint.com is a famous fridge repair services provider company that offers repairing service for all brands like LG, LG, Hitachi, Samsung, Whirlpool, IFB, Panasonic, Godrej, Voltas, Videocon, GE, Haier, Zanussi, Electrolux, Kenstar, Bajaj, Bosch, Sanyo, Mitsubishi, Carrier, Onida, Koryo, Inalsa, Midea, Kelvinator, Siemens, Toshiba, Beko, Sharp, Blue Star, Reliance, Croma, Akai, Daewoo, Morphy, O-General, Havells at affordable price. We provide repair services for single door, double doors, side by side doors, commercial fridge and so on. Visit our websiteHome Appliance Repair Service in Delhi NCR. what is better than tulle and flowers?